Amita Health Alexian Brothers Health Center is partnering with the Chicagoland Area Affiliate of Susan G. Komen to bring free mammogram screenings and breast health education to low-income women in the community. Amita Health Alexian Brothers Cancer Institute was recently awarded a $75,000 grant by Chicago’s Koman affiliate, and as part of its new breast cancer screening program, women who are uninsured and underinsured can receive screening, diagnostic mammograms, and ultrasounds at no cost. Both organizations share a similar vision to make these preventative techniques more accessible and end breast cancer in local communities. “At the Komen Chicagoland Area Affiliate, we conducted a needs assessment of our community and discovered the need to address breast health disparities in underserved communities,” said Leticia Kees, Director of Community Programs and Partnerships. Breast cancer is one of the most common forms of cancer diagnosed in women in the U.S. – second to skin cancer. According to Breastcancer.org, one in eight women will develop invasive breast cancer, while it is estimated that more than 40,000 U.S. women will die from the disease this year alone. Roughly 85 percent of cases of breast cancer occur in women with no family history of the illness. Like you, those of us here at Freedom Home Care understand the importance of early detection when it comes to breast cancer. Mammograms are a noninvasive x-ray that creates pictures used to detect and evaluate changes in the breast. They play a vital role in helping detect cancer in the beginning stages when it’s most treatable. The American College of Radiology says this procedure can actually reveal changes in the breast two years before a woman feels it, while helping reduce the rate of breast cancer in the U.S. by 30 percent. Mammograms offer other benefits as well, such as the prevention of extensive treatment in advanced cancers and improved chances of breast conservation. Even if women experience no breast cancer systems or have no history of the disease in their families, the American Cancer Society (ACS) still recommends receiving mammograms at age 40. 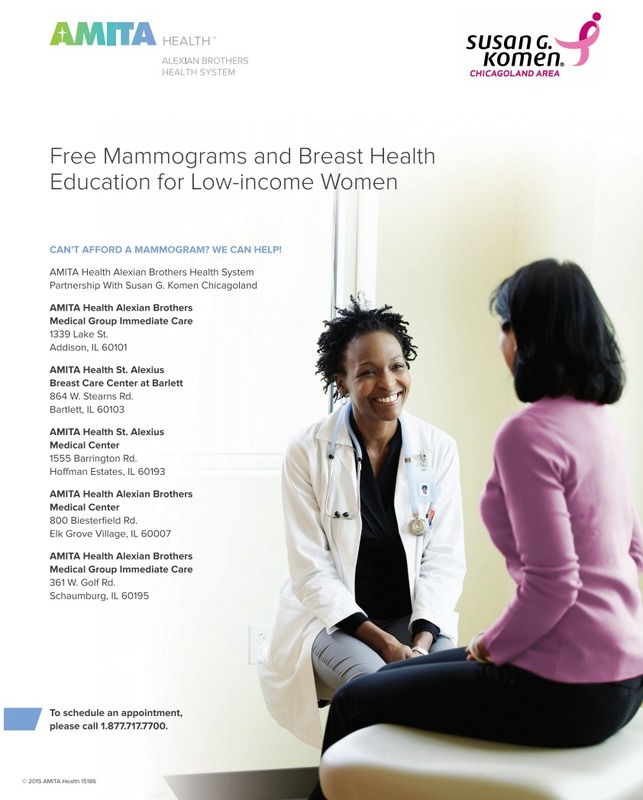 Amita Health Alexian Brothers Health Center are now offering free mammograms at a location near you.